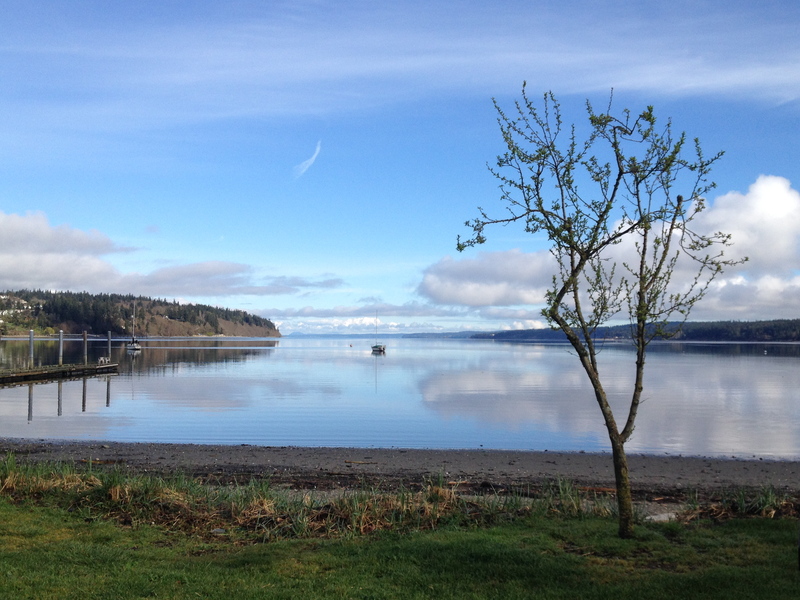 Last week we made a three-day visit to Lopez Island, where we saw our friends George and Kay Keeler. Lopez is the third largest of the San Juans (after San Juan and Orcas). It’s about a half-hour ferry ride from Anacortes. Total travel time for us is about two-and-a-half hours, including waiting for the ferry. Besides the ferry, you can also get to Lopez via a float plane from Seattle. George and Kay have a lovely house that’s well secluded in the woods, though it’s a stone’s throw from the airport and the golf course. They fed us well and showed us around the island by car and on foot. One night they treated us to pink scallops (which turned out to be more like mussels than scallops) and halibut from a local fishery. Lopez is proud of its seafood and supplies restaurants on the other islands and in Seattle. In some ways, Lopez is a lot like Whidbey. In others, it’s quite different. With 2,200 people spread over about 30 square miles, it feels, if anything, even more rural. It’s more remote from the mainland and things seem to run at a nice, slow pace. There are two stretches of road where the speed limit is 45. On the rest of the island it is 35 or 25. (On Whidbey, we have a state highway where you’re allowed to go 55.) With few cars, low speed limits, and a gentle landscape, Lopez is extremely popular with bicyclists. Over all, the island has kind of a New England feel. As on Whidbey, the people are very friendly. When we said we were from Whidbey, people’s first reaction was to ask whether we were bothered by the noise from the jets at the Naval Air Station. The answer is no because we live on the south end and most of the jet noise is up island, but clearly Navy jets are the thing most Lopez islanders associate with our island. The jet noise has become a point of contention on our island, in the San Juans, and on the Olympic Peninsula. On our final evening, we had dinner at the Haven, a lovely restaurant with excellent food, friendly servers, and a terrific view. After an all-to-short visit, we headed home on the ferry. We’ll be back. And we look forward to a visit from George and Kay, so we can show them our island.